Known as Tahoma by Native Americans, Mt. Rainier is a massive stratovolcano located just southeast of Seattle, Washington. On a clear day, the mountain will dominate the city skyline even though it is located 54 miles away. It is the most topographically prominant mountain (13,211 ft which is greater than K2's 13,189 ft) in the contiguous United States and the Cascade Volcanic Arc, with a summit elevation of 14,411 ft and includes two volcanic craters. With 26 major glaciers and 36 square miles of permanent snowfields and glaciers, Mt. 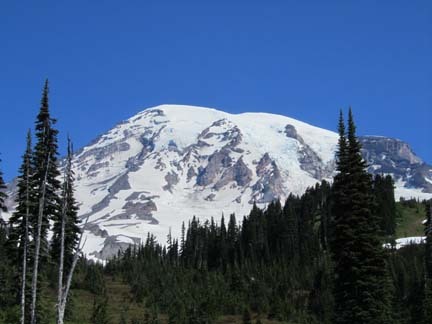 Rainier is the most heavily glaciated peak in the lower 48 states.